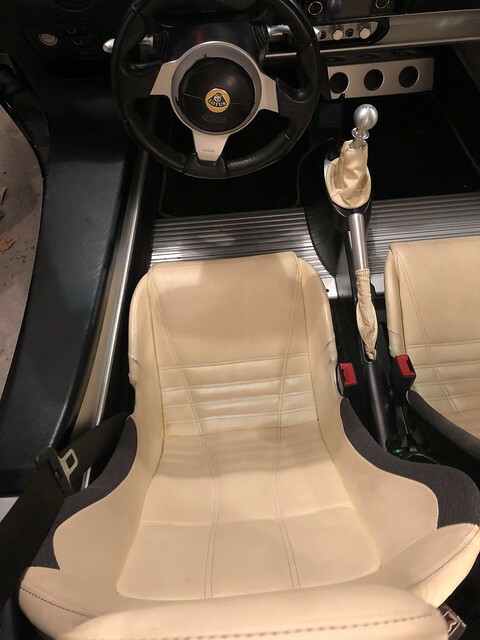 LotusTalk - The Lotus Cars Community > Lotus Discussions > Interior/Exterior > Fixed Position Bracket for Stock Driver Seat? TallRails. I don't want my knees crammed into the steering wheel. Can holes be drilled in those rails to get stock (full rearward) positioning? Do corbeau rails or others work with the stock rails? another option would be FIA Rails available through British Racing Group. as for the tallrails and modifying them for the position you want - I've modified a set already to put the seat forward (I'm rather short... and like a more reclined driving position). How far back do you need the seat? I can snap some pictures of the tallrails for you if you need some to get a better idea to see if you can get them to work for you. Thanks. I basically just want the stock seat rails all the way back. That's the way I've had them for the last 11 years! So same recline and position. The FIA rails do look like exactly the right thing. But a lot more expensive than a bolt! Do those fia rails allow the retention of the stock 3pt seat belt? Also, what do you mean there is a lot of play in the stock rails? My advice would be to sit in another car... i don't detect a lot of play in the stock rails. It is natural to have some play, but he ^ has a good point about confirming if you actually have something loose on top of the natural play. It is a start, at least, but I know I had a problem where a previous owner put a longer bolt in and the frame could wiggle a bit. Fixing that for me made a huge difference. Try your passenger side rail and see if that works for you. That might work Ted. I wasn't sure whether the bolt spacing is the same. JDS62F: Good point about the FIA rails. I do indeed want to keep stock belts. As to the other questions: Its definitely play in the rail. 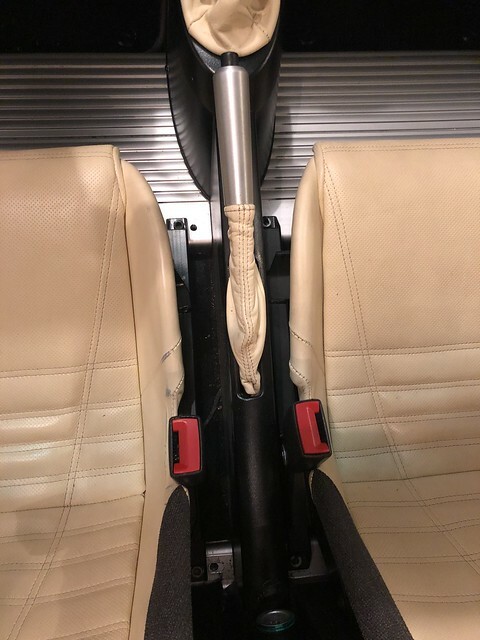 I can see the two parts of the rail (the part attached to the car and the part attached to the seat) each fixed to their respective positions, but moving relative to each other a fraction of an inch. I've owned the car for 10 years and it has gotten much worse in the last 2 years or so. Bolt through the rail may be the best solution after all. I just went though this again. I had the tall rails but the seat back was under the roll bar cover which put my massive head in line with the roll hoop - basically if I was in an accident my head would be split open on the corner of the roll bar cover. This always scared me so I decided to look into other options. It turned out the tall rail was in it's most upright position so the only option was to set it forward. I did that but lost too much leg room so decided to try using the stock passenger seat bracket. The LHD passenger seat rail won't fit. The tub is wider at the back than the front so the seat rail is angled too. I called Robert at BRG and he said that the RHD passenger seat bracket should work so I ordered it. It fits although it lines up pointing a little toward the center of the car and a little closer to the door than stock as the bolt holes don't line up as you'd expect them (did Lotus deliberately do that so it couldn't be used?). My head is now save although I lost a little head room - i'm fine but can't wear a helmet with the hardtop on and leg room is restored. The RHD passenger seat rail was something like $60 so not a huge expense. Thanks again all. Those custom rails from britishspeed look like just the trick... if I had time to weld up a pair. 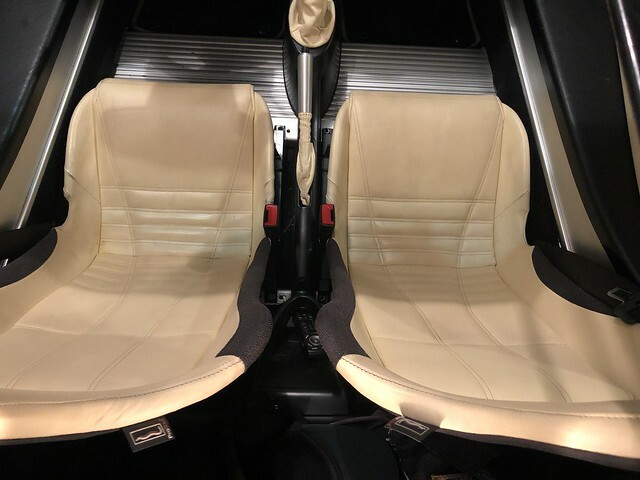 Cornbeef: Does the stock RHD passenger bracket position the seat similar fore-aft to the LHD passenger bracket (when installed on driver side of LHD car)? Any pictures showing how turned the seat is would be awesome. 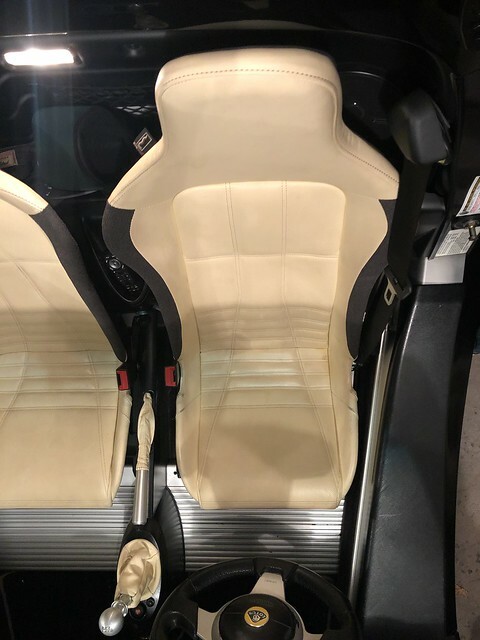 The rhd passenger bracket puts the seat in a similar position to the adjuster rail in the rear position but a little lower. It’s as low as the tall rail in its upright position. There is a little more space between the seat and the center console but it feels fine. I decided I needed the seat as far back as it could go, and the RHD passenger rail would lose me an inch or so. So I ended up going the bolting route (one bolt through each rail). Zero play in the rail now.